A heart patient bracelet or heart patient jewelry is probably the last thing on your mind after being recently diagnosed with chronic heart disease. After all, bracelets, necklaces and anklets may not seem to serve any purpose beyond being decorative. However, when it comes to chronic diseases like heart disease, being easily identified as having a medical condition is often necessary in emergency situations. This is why heart patient bracelets are often worn to alert people, such as rescuers, first-aid staff and medical professionals of the appropriate action to perform when the wearer is involved in an emergency. Immediately knowing that a person in distress is a heart patient allows emergency personnel to take appropriate actions. When cardiac patients were first encouraged to wear heart patient bracelets, some people were not very supportive of getting "tagged" as a heart patient. However, the fact that the bracelets were medical alert tags and could make a difference between life and death in an emergency quickly showed why it was a necessity. Today, even with modern technology, doctors still recommend a medical ID for everyone with heart disease. Heart patients require special medical care and immediate attention. In some emergencies, the heart patient may not always be able to speak or communicate. He or she may even be unresponsive. Furthermore, an emergency may occur when a relative or a friend who has knowledge about the heart patient’s condition may not be around. In these cases, a heart patient bracelet can silently inform the attending medical personnel of the disease, if they have a pacemaker or cardiac implant, and even where the person keeps their medication (like nitroglycerin) if necessary. Certain metals used in implantable devices, such as a stent, artificial valve, pacemaker, and ICD, may be “ferromagnetic” which means they are attracted to magnets. This may mean you cannot have an MRI if you are injured. Most patients who have had open heart surgery for a coronary artery bypass or valve replacement have metal sternal wire sutures which are generally considered to be safe for MR imaging, but may interfere with the quality of the image produced. 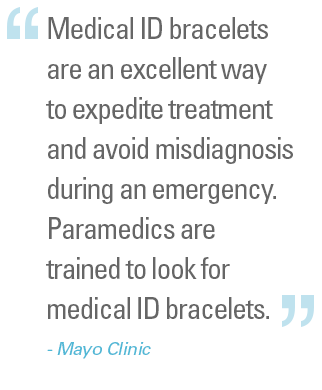 A heart patient medical identification provides important information to the emergency team. It will help determine whether an MRI would be safe to use to diagnose injury. Additionally, if you have a stent, you have likely been prescribed blood thinners. Emergency responders need to know if you’re on a blood thinner, so they are especially cautious of any potential blood loss.